What a treat! Someone gave a gift of some exquisite Amaretto from Italy ! 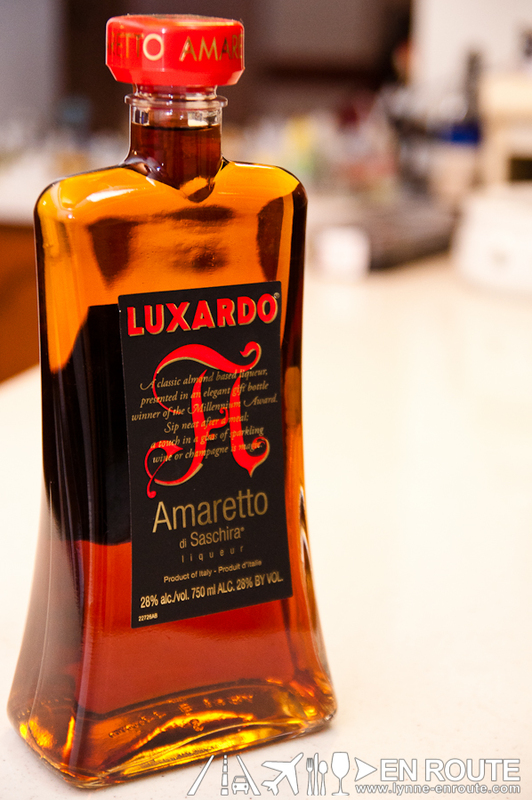 Amaretto is a liqueur from Italy, that is made from a base of the pits of apricots and almonds. It is very aromatic, has a strong, sweet taste of almonds and burnt sugar with a slight palatable bitterness. The most popular brand of this is the Disaronno Originale. Most people know this as the base drink for Amaretto Sour. But another drink that will surely get some fans is the Godfather. 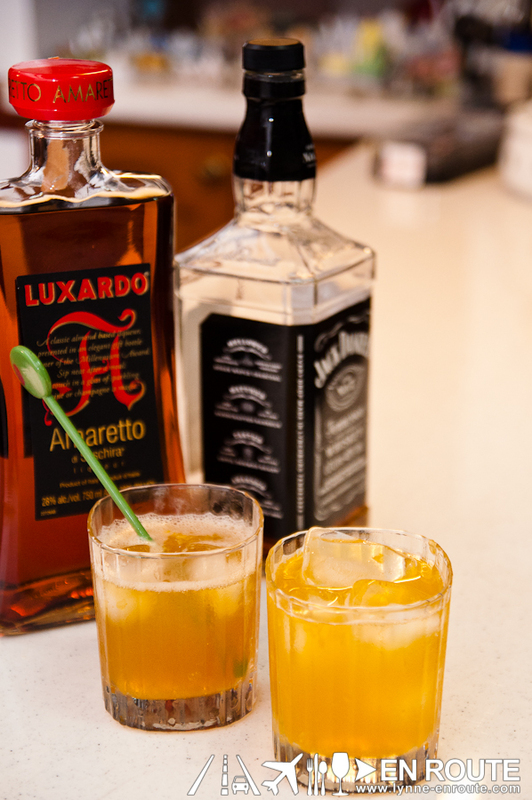 Godfather is just a mixture of two parts whiskey and one part amaretto over ice. What we will be making here, though, is a Godfather Sour: a modification that adds some citrus notes. In the book 501 Must Drink cocktails, it lists to use lemon juice. But since Filipino taste buds love something sweeter, this will now be replaced with orange juice. Combine all the ingredients into a shaker. If there’s no shaker, just mix it together in a glass. Squeeze the lemon and fill glass with ice. Serve. This will be a hit on your more sophisticated night caps that are slowly replacing those frat party drink-a-thons. You will notice, one glass seems to be of darker color. This is because after some thought, it’s not all the time that everyone can get some Jack Daniels and imported amaretto. And so, with liver health already hanging in the balance, some experiments using locally sourced substitutes was “perfected”. Just mix everything and serve with glass full of ice. This one is a creation we are proud of, as compared to some mediocre attempts like that Melon Rum Flavored Mojito, or that strawberry flavored beer (although some have given thanks into making their San Mig Light taste better with such a simple addition). Give it a try and let us know if we have one way or another, enriched your drinking experience. The name “Ninong” was made up just because it does sound appropriate given how local this drink is. If someone already owns the name for that drink, please let us know. If not, please do not copy it and call it your own. No one wants another stolen lechon kawali pictures episode. We are here to make friends.